The Squatters and clubbers clothing label ‘Dirty Smart’ have combined skill sets to release ‘Brainfreeze’, to be released by record label ‘What’s Your Status’ across all the usual download stores. It’s also the name of a t-shirt design by Dirty Smart which will be dropping nationwide in BANK at the end of October. As a track, ‘Brainfreeze’ is riddled with all sorts of crazy organs and trademark production from The Squatters. They’re favourites of Kissy Sell Out, have supported Fatboy Slim on tour and were also residents for Judgement Sundays in Ibiza this year. 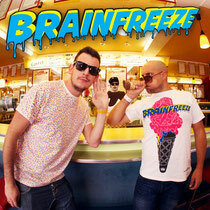 As a tee, ‘Brainfreeze’ is a riot of CMYK, with your textbook Dirty Smart raw edginess.